Jusst Sooup’s day starts at 2:00 AM 5-6 days a week. 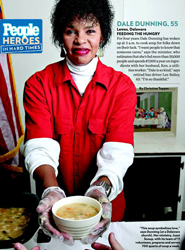 Jusst Sooup Ministry has served over 55,000 meals! They make over 700 quarts of soup a week which continues to increase. Jusst Sooup started with soup and now provides clothing, toiletries, groceries, and monetary support so that those in need can purchase prescriptions, transportation and shelter. Jusst Sooup uses the donations wherever the need arises. None of the volunteers, including Dale Dunning, the President of the organization receives a salary. Jusst Sooup depends on individual and business donations. They do not receive any funding from the state or government agencies.